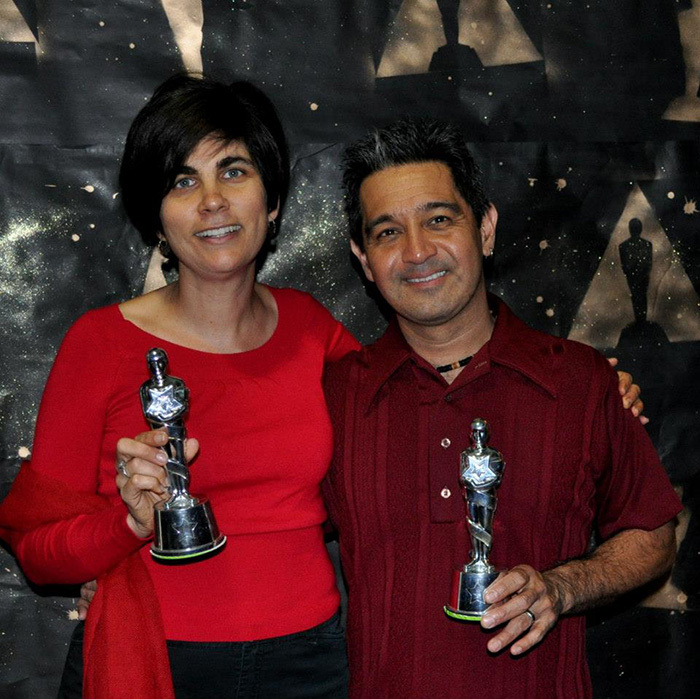 Our November volunteer in the spotlight is Filmworks advisory board member Sasha Khokha, pictured here with husband Karl Kaku and a pair of fake Oscars. Sasha recently won a real-life Emmy Award for her reporting work for KQED. Occupation: Sasha writes about the Central Valley as a journalist for The California Report, a statewide public radio program produced by KQED Public Radio. KQED is the NPR station for the Bay Area, and The California Report is their flagship program that airs on more than 30 public radio stations all over the state, including Valley Public Radio here in Fresno. Sasha is a former member of the Filmworks Board of Directors, where she volunteered her work on programming in the earliest years of the Fresno Film Festival and also worked with visiting filmmakers. She currently serves on the Filmworks advisory board. How are you still involved with filmmaking in your current job as a public radio reporter? After you left the Board of Directors, what has been your typical volunteer experience with Filmworks? What’s one of your most memorable board or volunteer experiences with Filmworks? What do you think is the best part of the Filmworks experience? Avigdar Adams, Hazel Antaramian-Hofman, Sanzari Aranyak, Cleo Bauer, Barlow Der Mugrdechian, Rita Dias, Frank Dougherty, John Dunning, Richard Flores, Trin Gibney, Megan Ginise, Satch Gonzales, Karen Hammer, Michele Hansen, Rebecca Horwitz, Neal Howard, Carl Johnsen, Kathryn Johnsen, Andy Julian, Sasha Khokha, Jasmine Leiva, Yvette Mancilla (intern), Richard Markley, Monica Marks-Rea, Hagop Ohanessian, Dominic Papagni, Angad Puniani, Andrew Ranta, Gene Richards, Bill Rovin, Justin Secor, Richard Stone, Sky Sweet, Jon Veinberg, Suzanne Watkins.